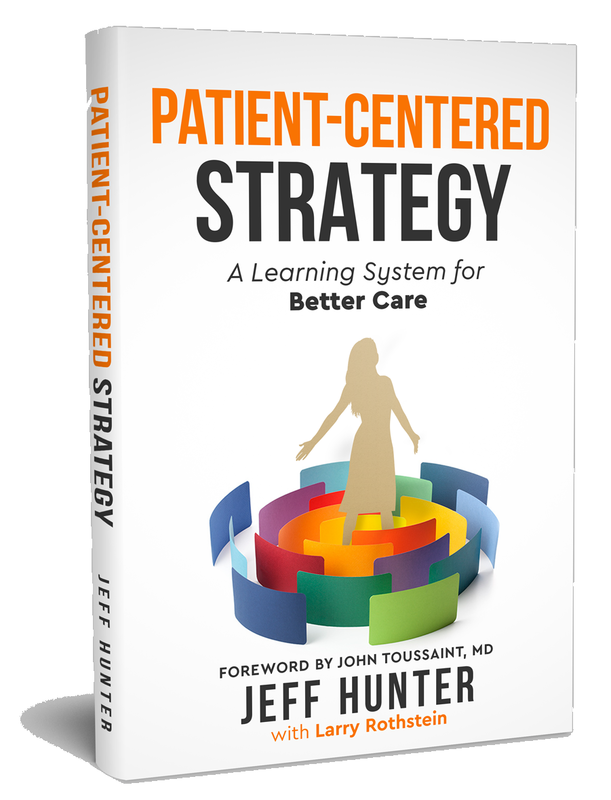 In Patient-Centered Strategy, Jeff Hunter, a leading healthcare strategic planner for more than 40 years, describes a powerful new system for strategy formulation—one that derives value from an in depth understanding of patients’ needs, and unites senior leaders with frontline caregivers in the creative process. At a time of unprecedented healthcare industry turmoil and growing inroads by competitors from CVS to Amazon, hospital CEOs and senior leaders need an innovative, comprehensive approach to strategic thinking. He helps you identify your current strategic issues, formulate solutions, and then determine “What must be true” to solve problems and explore opportunities. Patient-Centered Strategy describes proven techniques on how to test your solutions quickly and then deploy the results effectively throughout your entire organization for sustained transformation. Patient-Centered Strategy is also a powerful story of personal change, tracing Jeff’s journey from a conventional planner to an innovative practitioner on the cutting edge of 21st century strategic thinking. Strategy has never been more important, not only for leaders, but also for those we serve. It’s a new time and strategy engaging patients, staff and communities will help us to transform to the Triple Aim; better health, better care and lower costs. This book redefines the way we should plan and execute strategy and offers practical and helpful steps to thinking about the future. Patient-Centered Strategy provides a systematic approach for making more informed choices that will create and sustain transformational improvement in health care delivery. You will never think of strategy in the same way again. Jeff lays out a masterful description of a breakthrough approach to strategy development and design that helps organizations achieve their true potential. Based upon the solid principles of Lean Thinking, this well-orchestrated process moves people out of their conventional thought process to examine alternatives and approaches that yield dramatic improvement in business outcomes. Jeff’s journey, stated in passionate terms, is a story that we can use to encourage us to attempt to disrupt the status quo of conventional thinking. Thanks Jeff for bringing this exceptional dialogue to us in such an easy to understand fashion. 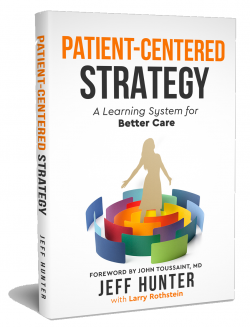 In Patient-Centered Strategy Jeff Hunter shares his deep experience applying lean thinking and a P-D-S-A mindset to strategic planning. He explains how strategic management encompasses three work streams that must be balanced and managed: strategy deployment, operational effectiveness and major projects. Essential reading for healthcare leadership teams striving to move their organizations closer to ‘True North. How ThedaCare Health System redesigned its system of daily management and transformed its culture. Two valuable books for leaders who wish to transform healthcare.